How fortuitous that ‘moon’ should be the subject for the photo challenge this week? We started our week with a total lunar eclipse early on Monday morning. Unfortunately, I missed the eclipse and it’s ‘blood moon’, but I did get the chance to see the super moon before it set behind the hills above Algeciras across the Bay of Gibraltar from where we live. 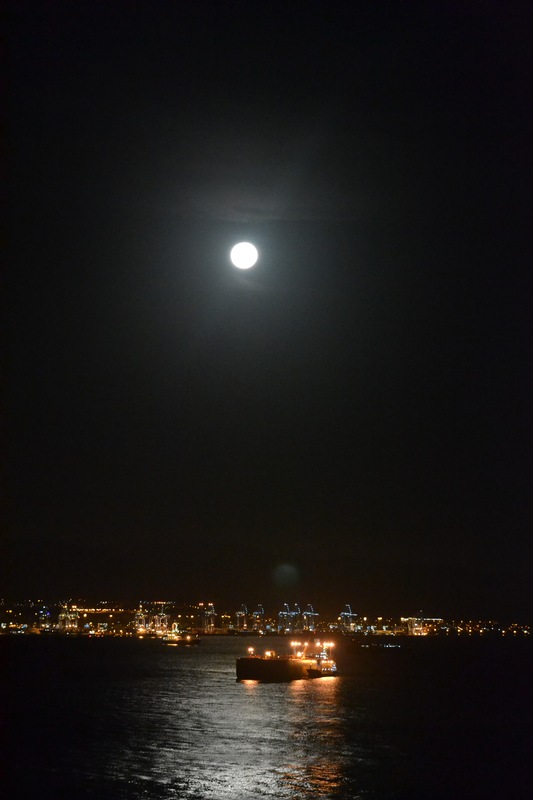 The last time we saw a super moon in Gibraltar was in November 2016. I went down to Europa Point to see it. I’m linking with Alison in Andalucia for #52fridayphotos this year. The photo credit for this one goes to Mr Postcard. 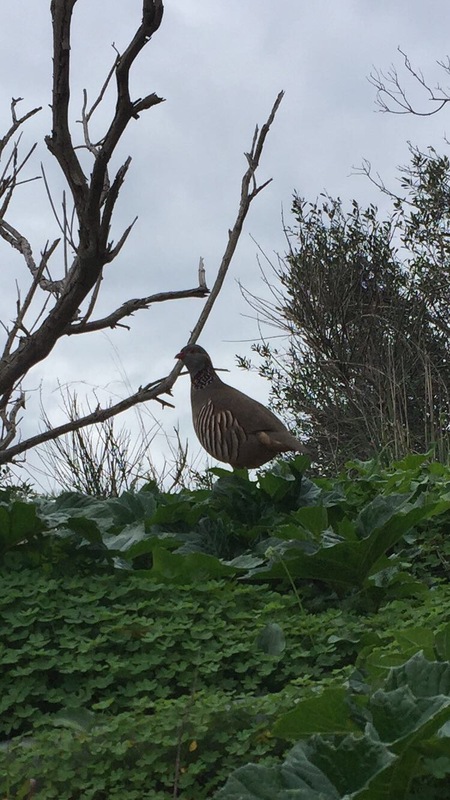 He went for a walk up the Med Steps on Sunday last week (I didn’t have the oomph) and on his walk he saw a Barbary Partridge. These partridges are native to Gibraltar and were reintroduced on the Upper Rock recently. You quite often see them but so far I have failed to capture one with my camera because as soon as you realise you have seen one it’s vanished into the undergrowth. Hats off to Mr Postcard for managing to be quick enough to snap this shy creature. There has been very little crafting going on this week, I did make it to my first dressmaking class of the year on Tuesday but as I’m pattern drawing at the moment for my next project there aren’t any pretty pictures of fabric to share yet. 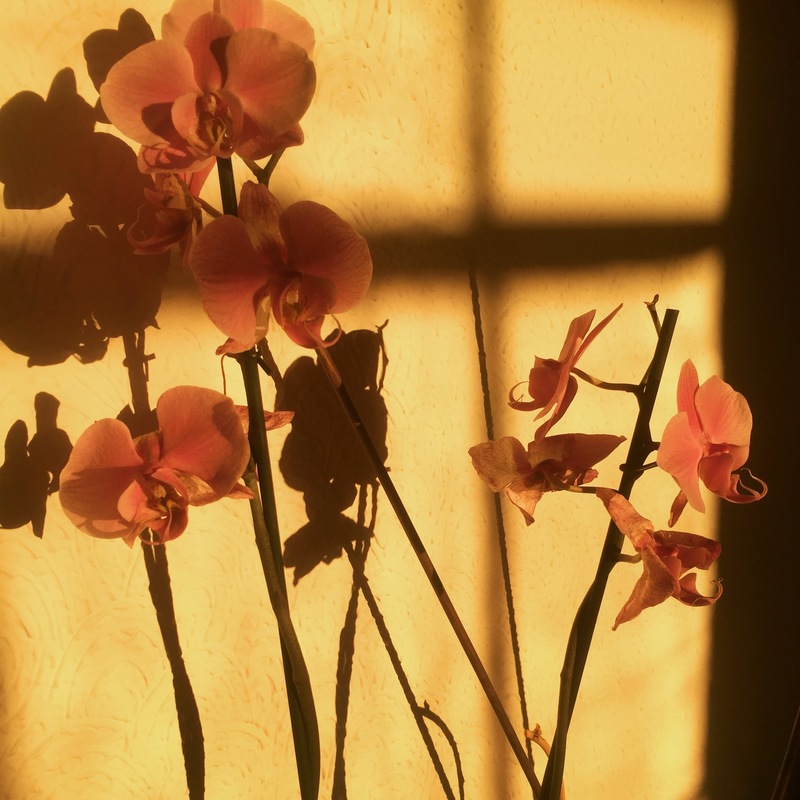 Will these orchids do? They looked so pretty in the golden light just as the sun was going down. As I opened the front door to see Eldest off to school one morning, I was struck by the bright full moon in the sky. This was less than an hour before daylight came but it looked magical as the moonlight lit up the water of the Bay. 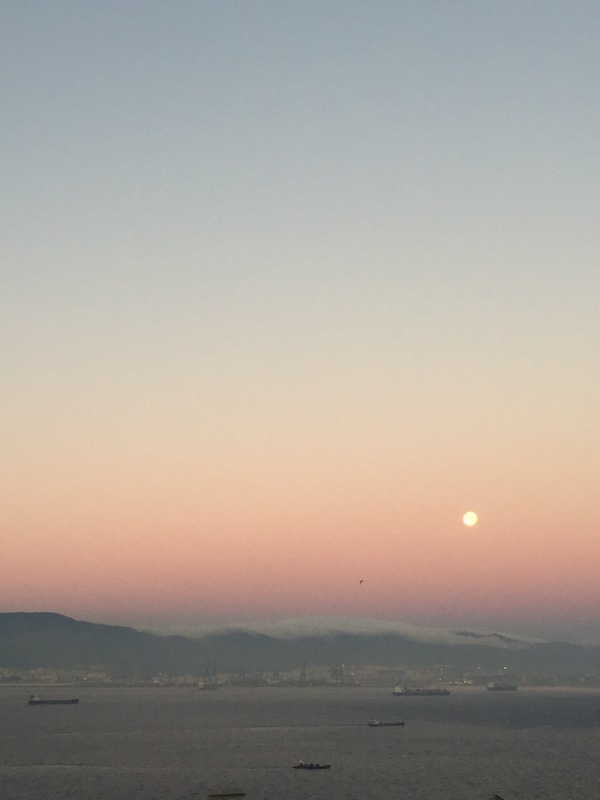 Another moonlight in the morning photo, this time it was on Friday when I saw the pretty pink sky at sunrise. We don’t get to see the sunrise as such as we face west but you still get the gorgeous colours lighting up the sky. I haven’t mentioned before now, but our rescue bunny, Snowflake, has been rather poorly of late. In fact at New Year we were worried we might lose her. It turned out that she had mange. Perhaps she had it when we found her, perhaps she caught it from our newest addition, Diamond (although he shows no signs) we don’t know. While she was laid low with the mange, an X-ray revealed that she had a chest infection, plus she had an eye infection. I spent the past week giving her children’s banana flavoured antibiotics and administering eye drops and sinus massages (I kid you not) to try and get her well again. 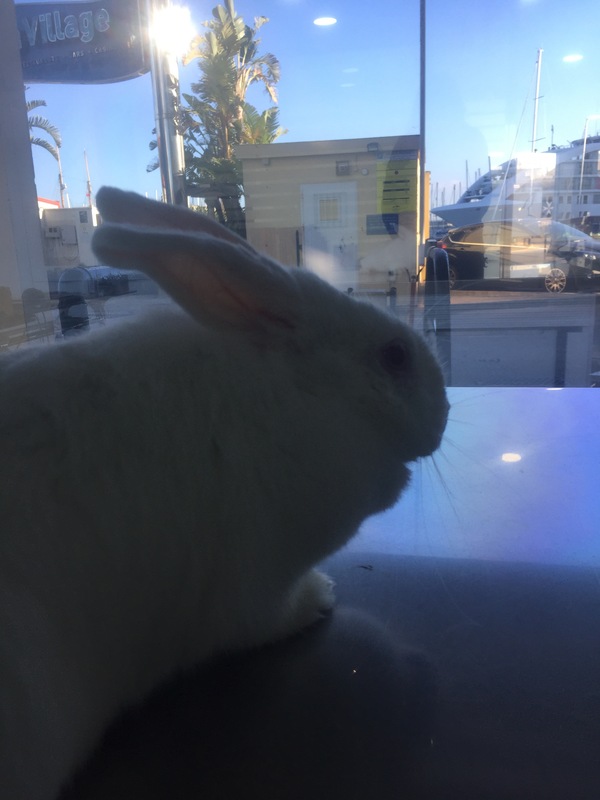 Here she is at the vets (again) on Friday morning. She was just about to have her final mange injection. I’m pleased to say that she has completely recovered from her chest infection and eye infection and the final signs of mange should disappear in the next few weeks. Diamond, on the other hand has shown no signs of ill health, in fact he’s positively bouncing. It turns out he’s quite a handful. On Friday I put him into his ‘run’ in the hall to give him a bit more space. It’s made out of an old fire guard and is attached to Snowflake’s run (an old play pen). I never in my wildest dreams thought he’d be able to get out – I was wrong. He was discovered wandering around the lounge. He must have climbed up out of the run, went for a wander in the hall (there were poos and straw marking his route) and then went for a run about in the lounge. I’m just relieved he decided to give the wide open front door a miss. 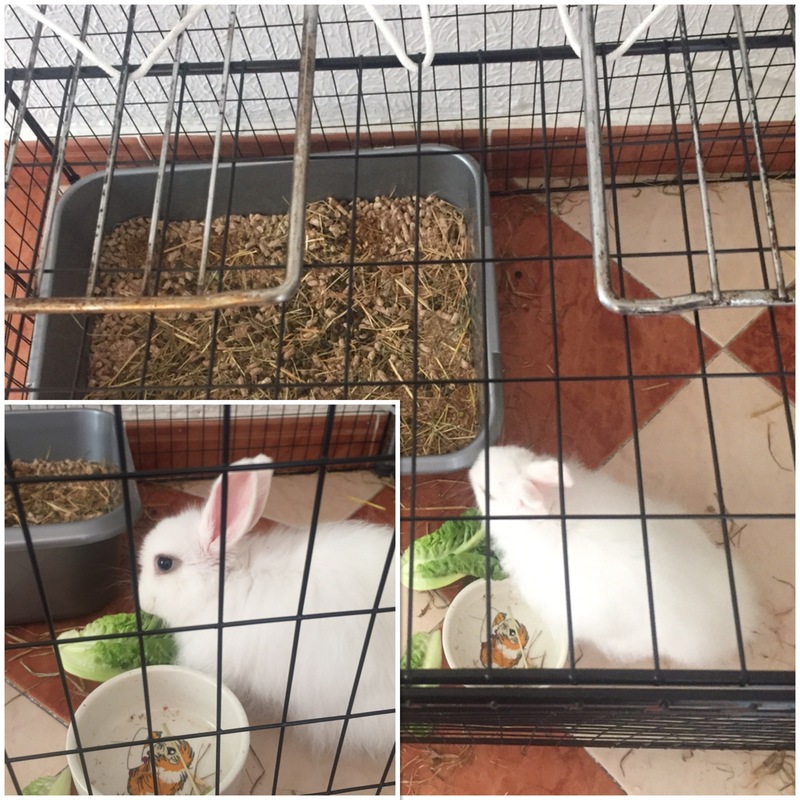 I thought that as Snowflake is having a bit of time post injection in her cage, I’d move him into her run (it’s taller and has chicken wire around it so it’ll be harder to climb out). Wrong again. When I went to check on him later, he’d climbed out of that and back into his original run. He now has a lid on it, rather fetchingly made out of old oven shelves and washing line… not the most attractive thing but until we think of an alternative it will have to do… honestly he’s worse than a toddler!! By the end of the week I was feeling well enough to pick up a crochet hook again and managed to finish a project I’d been working on since before Christmas. This meant I was free to get on with something new. 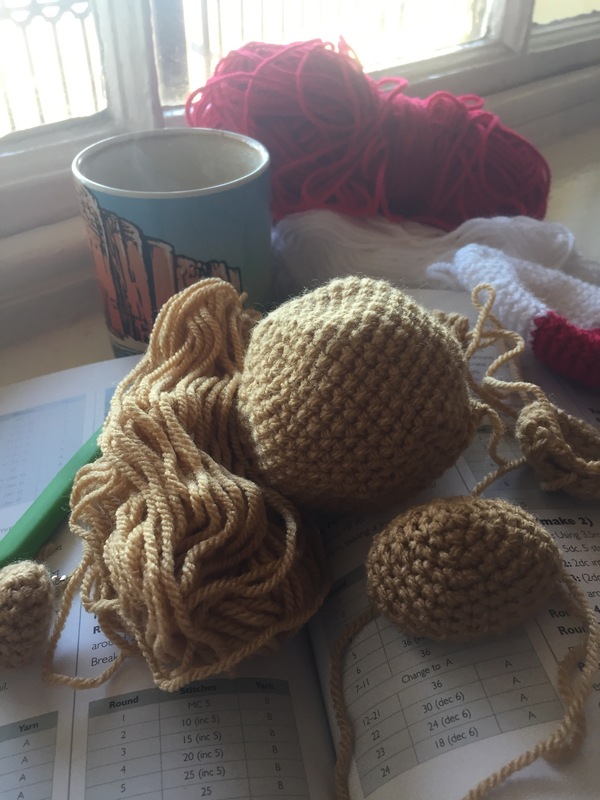 I’ve been looking forward to getting started on this, and it’s taking shape quickly – one of the joys of amigurumi I guess. The lovely book I am using for the pattern was a Christmas gift from my ‘little’ brother and I have got the perfect opportunity to make a little creature. I’m being a bit mysterious aren’t I? All will be revealed soon…. 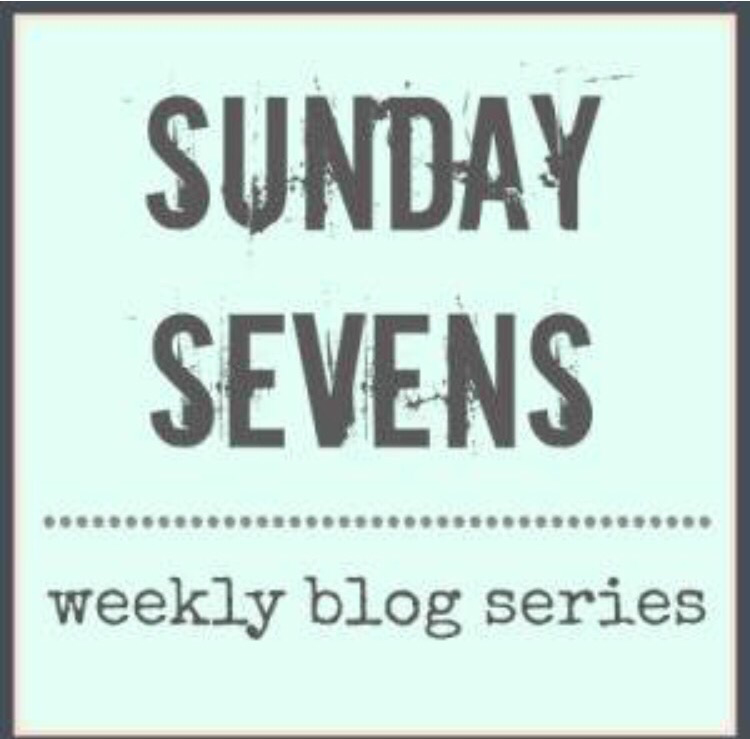 That’s all from Sunday Sevens this week, not the most inspiring one I know. Hopefully I’ll be back to full form next week and I’ll be able to tell you about more interesting things! Until then, I hope you have a good week and thanks for stopping by.